In this year’s September edition of Nature Structural and Molecular Biology, Associate Professor Marnie Blewitt’s laboratory revealed that the noncanonical SMC protein Smchd1 is a novel regulator of long-range chromatin interactions in mice. The study, conducted primarily at the Walter and Eliza Hall Institute of Medical Research in Melbourne, tested the role of Smchd1 in maintaining chromosome structure using in situ Hi-C in Smchd1 depleted female mice. In doing so the authors discovered a role for Smchd1 in regulating Hox clusters in particular – thus adding to the canon of proteins known to epigenetically regulate Hox gene silencing during development. The report focused on the effect of losing Smchd1-dependent chromatin interaction in the inactive X (Xi) chromosome. This showed an increase in X-linked chromatin interaction in the absence of Smchd1, without the expected increase in reactivation of genes from the Xi. Instead, the report reveals, “spreading of trimethylated histone H3K27 domain into regions not normally decorated by this mark” on Smchd1 depleted Xi. 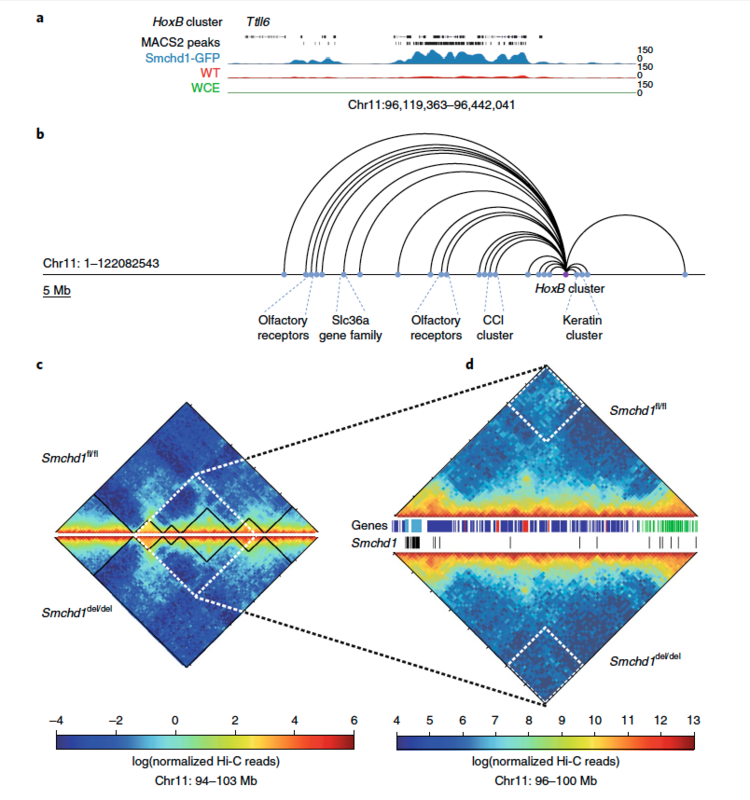 The authors conclude that Smchd1 is able to insulate chromatin to limit access to other chromatin-modifying proteins and thereby regulate long-range chromatin interactions, thus adding to our understanding of how chromatin architecture is regulated. From Melbourne’s Murdoch Children’s Research Institute, Professor Richard Saffery and colleagues have published an investigation on naïve CD4+ T cell activation in a cohort of infants with egg allergy. The study design involved activating T cells from non-atopic (control) and atopic individuals under non-differentiating conditions, and then profiling DNA methylation, gene expression and cell proliferation in these cells. The authors gained insight into naïve T cell responsiveness to activation. Comparison between the two groups showed that infants with food allergies have gene dysregulation in their T cell activation pathways leading to poor lymphoproliferative responses. 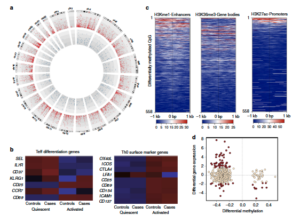 The study reveals that the suboptimal T cell responses are underpinned by “reduced expression of cell cycle–related targets of the E2F and MYC transcription factor networks, and remodeling of DNA methylation at metabolic (RPTOR, PIK3D, MAPK1, FOXO1) and inflammatory genes (ILIR, ILI8RAP, CD82)”. The pathway modifications by gene-environment interactions seen in food allergy are thereby connected to epigenetic dysregulation in the early stages of signal transduction from the T cell receptor complex. This study, led by Associate Professor Lee Wong at Monash University in Melbourne, reveals that oncogenic histone point mutations can “exert their effect through interaction with a range of epigenetic readers, writers and erasers”. Looking at the G34R (glycine to arginine) substitution mutation in the histone variant H3.3, the authors report downstream widespread changes in H3K9me3 and H3K36me3. The H3.3 G34R mutation is found in paediatric gliomas and the authors unravel that the changes to H3K9me3 and H3K36me3 are because H3.3 G34R is able to bind the demethylase KDM4 and inhibit its enzymatic activity. Inhibition of KDM4 activity in this way then affects H3K9me3 and H3K36me3 activity. Indeed the H3K9me3 and H3K36me3 profile in H3.3 G34R mutants in mouse embryonic stem cells is shown to be similar to KDM4 A/B/C triple-knock down. Thus, the study identifies the KDM4 histone lysine demethylases as “the key chromatin modifiers, which are disrupted by this mutant histone” and demonstrates how histone point mutation in cancer may exert their effects by interacting with epigenetic readers, writers and erasers. From Melbourne’s Monash University, this study delves into transcriptional downregulation caused by intronic triple expansions. Expansion of trinucleotide repeats in intronic regions, as seen in diseases such as Friedreich’s ataxia and fragile X, can be expansive, with the possibility of up to 2,000 repeats. How these repeats lead to reduction in certain protein expression in these diseases was the interrogated question. Led by Associate Professor Sureshkumar Balasubramanian and published in Cell in August this year, the report revealed that: “triple repeat expansions can lead to local siRNA biogenesis, which in turn down regulates transcription”. The study goes on to show that this deregulation is mediated by RNA-dependent DNA methylation (RdDM) epigenetic modifications. 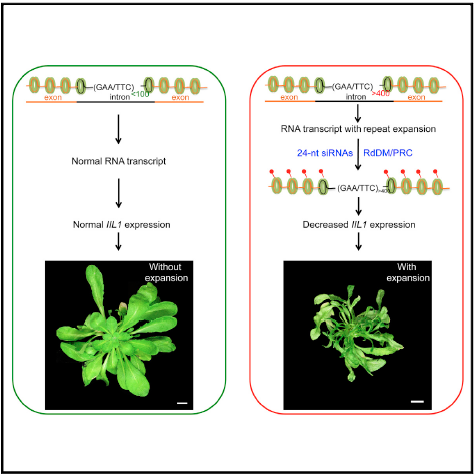 Using an IIL1 repeat expansion in Arabidposis Thaliana, the authors unravel this molecular mechanism for the transcriptional downregulation in Arabidopsis. The report points to the need to assess RNA-dependent transcriptional gene silencing pathways to further understand the epigenetic attenuation of protein expression, particularly for disease conditions such as Friedreich’s ataxia.